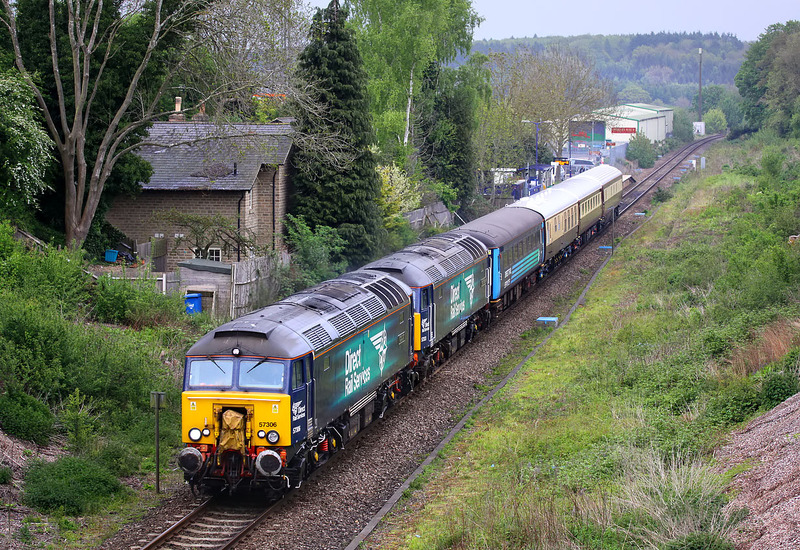 57306 Her Majesty's Railway Inspectorate 175 & 57303 Pride of Carlisle pass Hanborough on 2 May 2017 with the 5Z40 16:18 Eastleigh Arlington to Kidderminster ECS, conveying DRS livered Mk2 coach 5919 & Northern Belle Mk1 325, Mk2 3267 & Mk3 10729. As the Severn Valley Railway has now been awarded a ten year contract to service and store the Northern Belle coaches at Kidderminster, it seems that workings like this will become more frequent. Hanborough station platform can just be seen by the rear of the train. In the background is the Oxford Bus Museum, which by pure coincidence I had visited the previous day, and had revived childhood memories by travelling on AEC Renown FWL 371E.